Every Monday night we get together as a family and do an activity. We wanted to do something fun and different and my husband gave me the idea to make homemade Hula Hoops. We went to the store and each girl got to pick out their own color of tape to color their hula hoop. First, cut the hula hoops so they hit your child’s chest. Insert your connector to one side of the hoop. Then decorate it with your decorative tape. My girls played with these for hours after we made them! Can you elaborate by what you meant when your wrote "First, cut the hula hoops so they hit your child's chest." Do you mean when measured from the ground or something else? 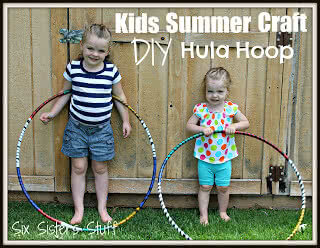 You can also make hula hoops for grownups. Use the 1 inch pvc irrigation pipe and measure about 160 inches. Use a coupler to join the ends (this is accomplished easiest when each end of the pipe is dipped in boiling water for about 30 seconds to soften the pipe) & decorate how you like. Makes a great exercise tool! I have not only lost weight when I use it consistently but it also helps my lower back pain immensely! @Lauren Look at the first picture-the circle height of the hoop should be chest high to each child. And, does it matter how much rice or beans we put in? Is it just for sound effects? THanks for any suggestions. I think this is such a cool thing to do with the kiddos. I have 2 girls of my own that would love this! !